Home Unlabelled THE BIGGEST FAMILY IN THE WORLD: INDIAN MAN HAS 39 WIVES, 94 CHILDREN AND 33 GRANDCHILDREN, LIVING UNDER ONE ROOF! Ziona Chana is the World recorder of the biggest family in the world. 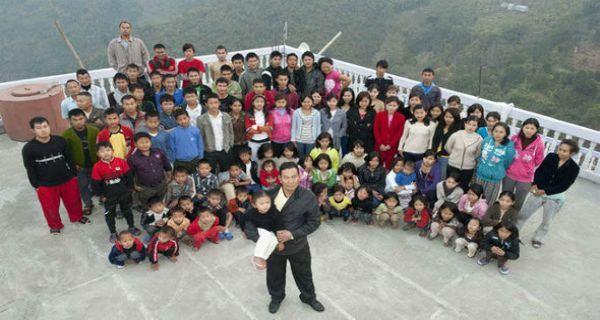 He has 39 wives, 94 children and 33 grandchildren, living happily under the same roof. They live in a mountain village near the Bangladesh-Burma border. His first year of marriages was rich, because the first year he got married with 10 women in a single year. The family has more than 100 rooms, in the four storey building which is located in Baktwang village, Mizoram, where his wives sleep in a giant dormitory. The family of 167, consumes 90 kg of rice and around 60 kg of potatoes a day. Moreover when its time for non-veg food then it takes 30 whole chicken for the family to prepare dinner for themselves. The wives take care of cooking, while the daughters do cleaning and washing and men do outdoor jobs like farming, jobs and many more. Ziona reportedly said, “Even today I am ready for marriage and can afford one more wife”. He further added, “I am lucky that God have given me so many people to take care for”. He has the luxury of his own bedroom in the house — to which the wives are summoned in turn. Although Ziona has his own large double bed, his wives have to make do sharing beds in dormitories. Chana keeps the youngest women near to his bedroom with the older members of the family sleeping further away and there is a rotation system for who visits Mr Chana’s bedroom. During the day he likes to have seven or eight wives with him all the time to wait on him hand and foot. Rinkimi, 35, married to Ziona for 11 years, says: “We stay around him as he is the most important person in the house. Serving him is like serving God. He’s the most handsome person in this village. Wife Ngaihzuali, 37, adds: “He often calls out for me to apply oil to his hair as he only likes me to do the job.